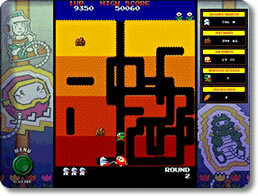 Dig Dug Game Review - Download and Play Free Version! 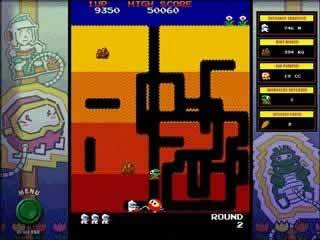 Here is the Exact Arcade Version of Dig Dug! Varying difficulty levels so you can adjust to your level of play. Classic mode and Enhanced mode with updated graphics. Not much variation level to level. Repetitive sounds can get annoying. Play Dig Dug, the Arcade Classic! Dig Dug is looking to pop those weird underground creatures without getting fried! Snare your enemies with your trusty pump and inflate them until they pop! Use your digging skills to dislodge rocks and squish them for big points! This is the exact version of the arcade game and not a remake. Choose Classic Mode for a trip down nostalgia lane or the Enhanced mode with better graphics. Play through all 256 dirt-digging levels and test your skills with all new stats! Destroy all the enemies on the screen in order to proceed to the next round. Get an extra life after reaching 20,000 points, 60,000 points, and every 60,000 points afterward! Easy: Designed for beginners, plus you start with an extra 2 lives! Normal: Tuned for PC casual play. Original: Just like the arcade version. New Enhanced Mode with updated graphics and sounds! When the harpoon has hit a Pooka or Fygar, use the pump to inflate it by repeatedly pressing the Spacebar or clicking the Mouse Button. To pull the harpoon out from the monster, move DIG DUG in any direction. Watch out for Fygars (the green monster). They breathe fire that can get DIG DUG from a distance and through dirt. Fygars can only breathe fire horizontally. DIG DUG's actual name is Taizo Hori, which is a pun on the Japanese phrase Horitai Zo , meaning, "I want to dig!" I bet you didn't know that. 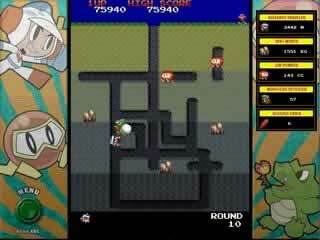 DIG DUG's son, Susumu Hori is also a famous video game star known as "Mr. Driller". The world record high score in classic DIG DUG is 4,595,010 points. I bet you can't beat that. In Dig Dug you must dig tunnels to lure in enemies. Once you have successfully maneuvered the enemies in, you have to finish them off with your air pump. That's right, in this game your weapon of choice is an air pump. This game will have you digging tunnels to avoid enemies that include fire breathing dragons and Pooka. Dig Dug is entertainment for the whole family. In this game your objective is simple, kill all the monsters in the level. Completing this task gets harder and harder as you move farther into the game. Each level adds more monsters that move much faster. There are two types of monster: Pooka a round monster with big yellow goggles and Fygar the fire breathing dragon. Defeating monsters is accomplished in one of two ways: you can inflate them until they burst with you air pump or you drop rocks on them. There are a limited number of rocks on each level and they must be carefully timed to hit an opponent. Points are scored for killing monsters and for digging tunnels. The deeper you are on the screen the more points you are awarded, you also will receive more points for killing a monster with a rock. Controls for this game are really easy. The arrow keys control movement and the space bar operates your air pump. Each level starts with Dig Dug in the center and an increasing number of monsters in various pre-dug tunnels. The monsters will stay in these tunnels for a short time, but eventually they will turn into ghostly eyes and will float through the dirt towards you. This can be used to your advantage since you can lure them into tunnels that you have set up so that you can kill them. The last monster on each level will attempt to flee by making its way to the surface and running off screen. Losing this monster doesn't lose the mission but you also don't receive the points for that monster. The graphics in this game vary. There are two modes available: Classic mode and Enhanced mode. Classic mode uses the graphics as they were when the game was created. These graphics are more grainy, but preserve the original nature of the game. Enhanced mode is slightly more crisp and the colors are brighter. Neither set of graphics is even close to modern standards, but they aren't supposed to be. The sound is also the same as the original game. Every time you move you make a sound. When you have to move all over the level over and over again that sound can get very very annoying. While the sound can be turned off, it would be nice if it wasn't so repetitive. The biggest limiting factor to this game is the lack of variety. Each level is almost identical. The number of monsters changes and the speed they move increases. Other than that nothing about the game varies. This is typical of older arcade games so if you are familiar with this fact it shouldn't be a problem. Dig Dug is a classic and is still entertaining today. You will have to dig tunnels and plan your moves carefully. The easy controls and premise means that anyone can play and have a blast doing it. You will also be challenged as you progress farther into the game. If you're a fan of older games or like games that require a bit of strategy, Dig Dug is for you.